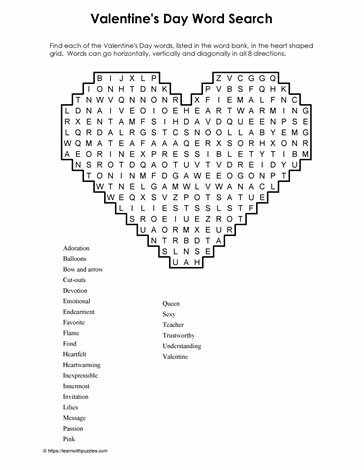 Word search Valentine's Day puzzle. Students love heaart-shaped Valentine's Day word search puzzles. Sure to engage student learning through building vocabulary skills and activating problem solving strategies. Digital, Google, regular and home schooling grade 4,5,6 classrooms will benefit from using these free, downloadable printable puzzles. Use differentiated instruction to accommodate reluctant learners and English language learners in the classroom.